Money seems to be the root of many problems, and definitely causing stress. When you have enough money, you want more. When you don’t have enough money, you want more. When you have more than enough money, you’re afraid of losing it. But the truth is that money is neither good nor bad. Any problem you have with money is solely because of your reaction to the money. In order to keep calm about your money situation, here are some ways to control your finances so they don’t control you, or stress you. Having a clear picture about your finances helps not worry about it. For many people, the problem they have with their money is that they have no idea how much or how little they have – and they may not want to know. But keeping themselves in the dark often leads to times of money worry which they simply do not need. In order to see what your financial situation really is, you need to be honest with yourself. Take some time to see what your bills are, how much income you have, and how much debt you have. In doing this, you will be clear about what your financial situation is and what you need to do about it. Thus have no stress about it at all. 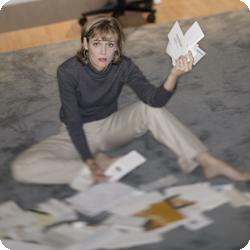 Do not avoid dealing with money management, as having a plan will kill your worries and stress. If you find that you are having troubles managing your money, you need to work out a plan. While some might call this a budget, a spending plan has a better connotation. This is not a time to create a super strict budget, unless it’s absolutely necessary. Instead, you will want to find out what you can spend each month and then try to find ways to reach this goal. If you go over, then you need to figure out how to prevent that from happening the next month. You will also want to create a plan for paying off debt so that you can release that stressful bill from your life. Whether or not you have any problems with finances, you do not have to think about it all the time. A good way to keep your financial stress at bay is to limit the time when you will worry about it. Some people decide to only acknowledge their stress for two hours a week, which will keep them on track, but it will also prevent long periods of stress. Or you might want to have one night a week where you manage your bills, doing do over a nice dinner and pleasant music. When you make managing your finances more enjoyable, they will seem less stressful. When you have financial woes, increasing your stress level isn’t going to help you pay anything off any sooner. Instead, find ways to manage your money, helping to reduce your stress and your debt load. You will feel a lot better and your checkbook will too.